Pikkolo Baby Carrier Review: Is It Right for You? Baby carriers may not be for everyone, but if you are going to invest your time and money in babywearing, it’s probably best to do it with a carrier that you can use from infancy to toddlerhood. Like the Pikkolo Baby Carrier, for example, which certainly takes your child from the newborn stage all the way through toddlerhood until they likely won’t want to be carried anymore anyways. With no infant insert required, you can use the carrier with your child from 8-40 pounds, and there are five different carrying positions to choose from. It also has memory foam in the shoulder straps to better shape around your shoulders as you wear your baby and make it more comfortable for you over time. It may not seem like a huge deal, but when you’re wearing your growing baby for hours at a time, any added comfort make a world of difference. The carrier is suitable for parents and caregivers of varying sizes, and it comes equipped with dual-adjustable buckles to make adjusting them as easy as possible. The waist is unpadded and worn higher to put less pressure on the abdomen and make it more comfortable for moms recovering from giving birth. But when it comes to getting the perfect and safest fit for your little one, you can easily cinch the cinch the carrier at the adjustable base. Overall, the carrier is designed to feel as comfortable as a wrap carrier but have the strength and durability of a more structured carrier. You can find it on the manufacturer’s website and Amazon. On Amazon, the Pikkolo Baby Carrier is $129. Check out the latest price! 3.1 Has This Item Been Recalled? 6.3 Has This Item Been Recalled? 7.3 Has This Item Been Recalled? 8.3 Has This Item Been Recalled? The straps cross in an X-shape on the back for the most comfort you can get out of a structured carrier. It’s made for children from 8-40 pounds. There are five different positions to choose from and a how-to video on the carrier’s website to help you get started. The shoulder straps can be tapered down to a more slim fit when wearing your baby on your back. You can adjust the buckles and base with ease and to put the carrier on properly, you won’t need outside help every single time. It holds little ones in snugly, but still gives them enough room to look around and feel comfortable. You can potentially use it from the time your child is born until they no longer need a carrier. It’s relatively easy to put on and get the hang of, even with there being multiple different carrying position options. The straps are plush and comfortable, but not overly so, meaning that your baby can still see out of the sides of the carrier. It’s also lightweight and doesn’t feel overly bulky overall. The waist strap might not be as supportive as it could be, meaning more stress on the shoulder area. It can be awkward or difficult for some parents to get their baby in and out of the carrier. All of the straps and buckles might be a little confusing for some parents or caregivers. There isn’t a whole lot of added support in the head area for your little one. There are no recent, or current recalls on the Pikkolo Baby Carrier. The Infantino Carry On Carrier is another structured carrier that can be used for both babies and toddlers. It’s made with padded shoulder straps for your comfort as well as a supportive waist belt to evenly distribute your baby’s weight as they sit in the carrier. It also has multiple zippered pockets for your convenience. 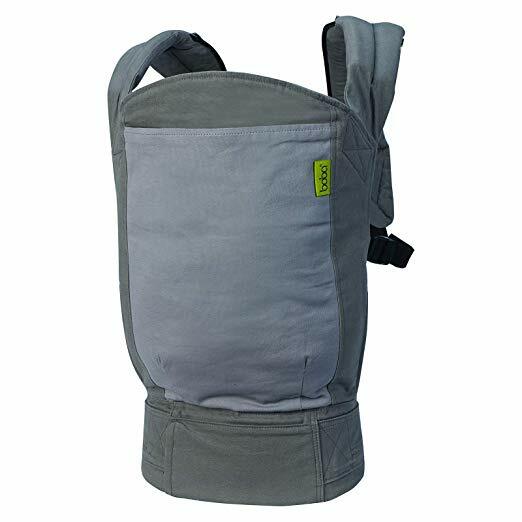 The carrier can be worn in four different positions, including back carry, which is always convenient for older or larger children. And like the Pikkolo, it can be used for little ones from 8-40 pounds. For easier airflow, the carrier has a breathable mesh panel, which works in keeping you and your little one cool while you wear them. It has fully adjustable straps on the shoulders, waistband, and back, to accommodate different sizes of parents or caregivers. You can find it on the manufacturer’s website and Amazon or in-store at Target. On Amazon, the Infantino Carry On Carrier is $50. Check out the latest price! The carrier has a handful of different positions to choose from for your growing child. For a carrier that can be used for years and in multiple different positions, the Infantino is relatively inexpensive. You can adjust the straps as needed to properly support your younger child’s head while in the carrier. It can be adjusted in size to fit parents and caregivers who are both petite and have larger frames. The buckles can be a little difficult to fasten together and then unbuckle afterward. The seat might be almost too narrow, so your little one won’t be in the perfect ergonomic M-shape at all times. Although you can adjust the buckles to fit different people, it can be a little uncomfortable for larger chested individuals. There are no recent, or current recalls on the Infantino Carry On Carrier. The LilleBaby 4 in 1 Essential All Seasons Baby Carrier was designed for the comfort and overall safety of little ones, and that’s definitely what matters most. The structured carrier is made with 100% cotton that can cradle your baby or toddler in comfort at all times. It can be used for children from 15-45 pounds and for babies even smaller than 15 pounds with the infant insert. It has six different carrying options, but four that can be used with the infant insert, so you won’t have to sacrifice many positions with the insrt involved. You can use the carrier in virtually any weather, and the zippered mesh panel can add more breathability during the warmer months. You can find it on the manufacturer’s website and Amazon or in-store at Buy Buy Baby. On Amazon, the LilleBaby 4 in 1 Essentials All Season Baby Carrier is $100. Check out the latest price! The leg holes have padded fabric so that they won’t pinch your baby’s legs. There’s also a side carrying position, which can be rare for some infant to toddler carriers. Four of the positions can still be used with the infant insert. You can use the carrier with little ones up to 45 pounds, which means you can use it even longer than the Pikkolo. The waistband can be uncomfortable worn over the abdomen for some moms who have had c-sections. It can be difficult to reach the buckles to adjust the carrier while you’re still wearing it. Compared to some other similar carriers, the padding isn’t very thick on the Lillebaby. There are no recent, or current recalls on the Lillebaby 4-in-1 Essentials All Seasons Baby Carrier. The Baby Tula Explore Baby Carrier prides itself on having what it calls every position your baby will need at some point. This includes facing out and back carry, which are both convenient for their own reasons. It has a built-in padded neck support pillow for smaller or younger babies, and it’s made of breathable cotton material. There’s also a removable hood that can be used to shield your little one from the sun or offer a shaded and protective area to nap while in the carrier. It can be used for children from 7-45 pounds and at less than two pounds itself, the carrier is relatively lightweight and easy to wear on your body for long periods. You can find it on the manufacturer’s website and Amazon or in-store at Buy Buy Baby. On Amazon, the Baby Tula Explore Baby Carrier is $179. Check out the latest price! Adjusting the size between differently sized parents and caregivers is easy. The fabric is a lot softer than that of some other similar carriers and therefore gentle on your baby’s skin. The carrier is comfortable enough for little ones to stay in it for long periods and comfortable enough for parents and caregivers too. Younger babies can be safe and comfortable in the carrier, even without an infant insert. It is on the pricier side, especially when compared to similar carriers. The shoulder straps can be difficult to adjust to the proper flat position. It might feel like it’s on the bulkier side, especially on smaller frames. There are no recent, or current recalls on the Baby Tula Explore Baby Carrier. The Boba 4G Carrieris made for children from birth to four years old or 7-45 pounds, which makes it one of the more long-lasting structured carriers out there. It includes an infant insert and sleeping hood and can be worn in three different comfortable positions. That being said, it may not have the versatility of the Pikkolo Baby Carrier, but it is lightweight and machine washable. And both of those seemingly small but important factors could play a big role in what some parents look for in a top carrier comparable to the Pikkolo. It has a zippered waist belt pocket for your convenience, and the waistband itself is meant to take some of the pressure off your shoulders as you carry your baby. You can find it on the manufacturer’s website and Amazon or in-store at Buy Buy Baby. On Amazon, the Boba 4G Carrier is $89. Check out the latest price! It’s lightweight, so bringing it with you on the go is a breeze, even if you don’t end up using it for your little one. The way your baby’s weight is distributed takes a lot of pressure off your shoulders while you carry your baby in the Boba 4G. It comes with an infant insert, so you won’t have to worry about buying one separately. It’s easy for most parents and caregivers to get the hang of the different straps and buckles quickly. It can get a little warm after wearing the carrier for a while. The strap buckle beneath the armpit can get uncomfortable. It is on the bulkier side for some parents, regardless of how lightweight it might be. There are no recent, or current recalls on the Boba 4G Carrier. The Pikkolo Baby Carrier might not be the best carrier out there, but when it comes to choosing the best carrier for your baby, that’s all subjective anyway. It is, however, a comfortable and easily adjustable carrier that’s meant to be worn for long periods and with little strain on you in the process. It’s also of the sought after breed of carriers that can be used with both babies and toddlers and in a variety of different positions. Clearly, there are some comparable carriers, but overall, the Pikkolo Baby Carrier is a fine choice for any parent looking for all-around comfort and safety. 5 Best Lillebaby Carriers: You Might Not Want to Choose Just One! Graco 4Ever vs. Graco Extend2Fit: The Ultimate Graco Battle! Kinderpack vs. Tula: Are These The Best Carriers for 2019? Lillebaby vs. Beco Baby Carrier: Which is Right for You?